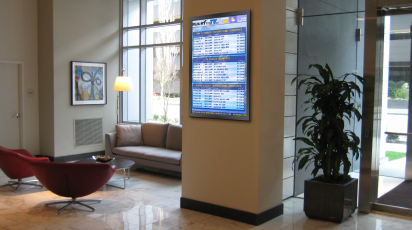 To show Flight Time TV on a lobby display, a computer is needed to receive the real time updates via the internet. A small form factor machine can be used, and depending on the size of the lobby display, some pc models even fit behind the screen. Broadcast flight information to a spare channel on guest TV networks. A modulator converts the video coming out of the PC and broadcasts it over an available channel so that your guests can view their flight status on the TV in their room. Depending on the size and resolution of the TVs in your rooms, you have the option of displaying multiple airports/feeds on a single channel or splitting each feed out to its own channel. Splitting the feed to different channels will require additional hardware. The digital modulator and the coaxial cables can be obtained from your in-room TV provider. They may also need to be contacted to setup an open channel, which may incur additional fees from your provider. With this type of feed, you can build Flight Time TV into an existing app or integrate into any digital signage / reader board. No additional hardware is needed for this method. Highly customizable and easily integrated code to implement into existing digital signage applications. You can design your flight board to use your property's color scheme and logos. You will also have greater control over which flight information is displayed, and how it is displayed. Please inquire about the hardware packages that are available through Flight Time TV. It is not required that hardware be purchased from Flight Time TV. Units to support the feed may be purchased elsewhere as long as the hardware meets the minimum requirements. "We partnered with Flight Time TV for a real time solution that provided our guests current flight departure times and cancellations. Their products are in an easy to read and use format and allowed our guests to stay updated and plan accordingly, while providing a much needed service. Amanda has always been an outstanding representative, reliable, diligent in her follow-up, personable and solution driven." "I worked with Amanda to provide Flight Time TV in the Loews Miami Beach Hotel. Process was fluid and working with Amanda and the company has been great." Flight Time TV was developed by the creators of SurferQuest business center solutions, to meet the travel needs of hotels and their guests. FTTV is a versatile system that can be integrated into any digital signage system and can be combined with news, weather and local information to provide guests with the convenience of on the go updates. Call us today to learn how our products can maximize your concierge services. © Flight Time TV, LLC. All rights reserved.